Clarita Lefthand-Begay is citizen of the Navajo Nation and an assistant professor in the University of Washington’s Information School. Her interdisciplinary research focuses on the protections (e.g., tribal codes, laws, guidelines, declarations, etc.) for indigenous knowledge in the United States, tribal water security, and climate health and resiliency. 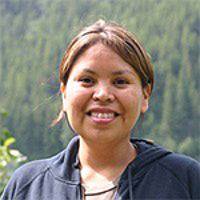 Indigenous knowledge systems are foundational to each of her projects. She is currently the Director of the Tribal Water Security Project, a project that examines the water insecurity challenges faced by tribes in the United States and around the globe. As a researcher and tribal community member, Clarita supports efforts to strengthen tribal wellbeing while respecting and honoring self-determination and cultural revitalization.